Today Emma had her 1 month check-up at the Pediatrician. She weighed 8 lbs, 11.5 oz & 20.75 inches long, so with these measurements she is in the 30% for her weight, 45% for her height. So the doctor was us to start offering her more formula 4 oz every 3 hours instead of the 3 we have been giving her. Dr. Koonce wants Emma to come back in for weight check in 2 weeks. She also is suggesting that since Emma has a heart defect that we should give her the RSV antibody shot this winter. 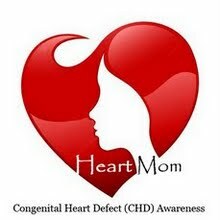 Studies have shown that children who were preemie, have a heart defect or neuro problems are more likely to contract RSV & she wants to be proactive. She is currently checking with our insurance to see if they will cover it since its very expensive. She also wants us to have her kidneys checked for any abnormalities. Dr. Koonce says sometimes babies with heart defects will also have renal problems as well so she wants to have an ultra sound of her kidneys just to cover all the basis. So the many doctor appointments continue. Everything else is going pretty well. She is starting to make eye contact with you while you hold her & she is smiling + cooing more & more everyday. Is she a month already? :) Life must be getting easier by now... HA! I asked about the RSV vax for my kids, too. It is mucho expensive! I hope you insurance will cover it. Of course, both my kids got it anyway, but they were premies... so I wasn't all that surprised. Keep me posted on her checkups. I can't wait to hear more! Robert was 25% for weight, 95% for height. Talk about a skinny baby! He didn't get that from me! We missed RSV (skipped the vax too)... whew!